The Glacier Express . . . The Glacier Express & Bernina Express are Switzerland's two most scenic train journeys - which has the edge? Darned if I can decide, you'll just have to do both. The Glacier Express is a regular scheduled year-round train service between Zermatt at the foot of the Matterhorn and St Moritz in the Engadin skiing area. Billed as Europe's slowest express, its a narrow-gauge train which takes 7½ hours to cover just over 290 km (180 miles), at an average of around 24 mph. 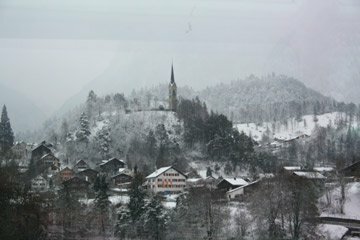 But you won't mind, as spectacular Swiss mountain scenery unfolds outside the train's panoramic sightseeing windows while you eat lunch accompanied by crisp Swiss white wine (their Johannisberg white wine is wonderful). The Glacier Express is run jointly by two private Swiss railways, the Matterhorn Gotthard Bahn (MGB) and the Rhätische Bahn (RhB), who also operate the regular hourly local trains over the same route. There is one daily Glacier Expresses in each direction in winter, but up to three daily Glacier Expresses in summer. Excellence class - New from 2019! 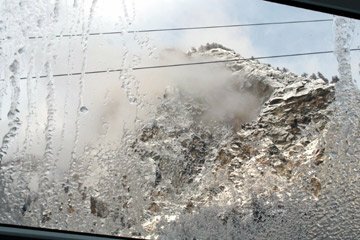 What's it like on the Glacier Express? 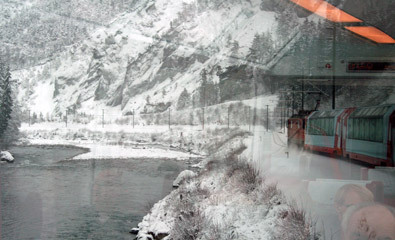 The Glacier Express uses modern panoramic coaches specially built for the service in 2006. This train is a real pleasure to travel on, clean, comfortable, carpeted and air-conditioned, its most distinctive features are the huge panoramic side windows and glass skylights as well, so you don't miss any of the scenery! In 2nd class, seats are arranged in bays of 4 around a table on each side of the aisle, in 1st class cars there are bays of 4 seats around a table on one side of the aisle and bays of 2 seats across a table on the other. Apart from more space and less passengers per coach, seats are very similar and there is little to choose from between 1st and 2nd class as both are excellent. There is a food service car, but staff come down the train taking orders for drinks, snacks and lunch. You can pre-book a complete meal, which is served at your seat on real china with proper cutlery and tablecloth, with a choice of starters, main courses and desserts, accompanied by a wide selection of wines. You can find sample menus and wine list at the caterer's website, www.rgswissalps.ch. Or feel free to bring your own picnic and your own beer or bottle of wine. First class seats: Glacier Express first class. Excellence class... New for 2019! The Glacier Express has 1st & 2nd class, but from 2019 there's also Excellence class. Excellence class is only available on trains 902 & 903 and only from 2 March to 13 October 2019. Excellence class gets you a seat in a special deluxe panoramic car with seats arranged 1+1 across the car width, face-to-face tables for two on both sides of the aisle, everyone gets a window seat. There's a cocktail bar at one end of the car exclusive to Excellence class passengers. A 5-course regional menu with wine is included in the reservation fee. Complimentary coffee, juice, snacks, champagne. A host travels with the car. In Excellence class, you luggage travels in a separate locked baggage area. See the 360º photo of Excellence class here (please let me know if this link stops working). To travel in Excellence class you pay the 1st class fare (a 1st class Eurail pass, InterRail pass or Swiss Travel Pass also works) plus a CHF 420 reservation fee (about €375). You can buy tickets at www.glacierexpress.ch and print them out. There is one daily Glacier Express in winter from Zermatt to St Moritz, but from May to October there are up to three daily Glacier Expresses in each direction. Summer = 11 May to 13 October 2019. Winter = 9 December 2018 to 10 May 2019, but summer trains 904 & 905 will start running from 19 April 2019. Trains 902 & 903 run every day all year round except 15 Oct to 9 Dec 2018. There is no Glacier Express service at all from from 15 October to 8 December 2018 or from 14 October until early December 2019. 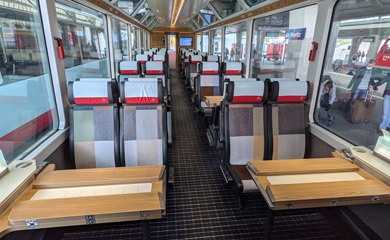 All trains now use the superb modern panoramic Glacier Express cars built in 2006, with hot meals served at your seat from a modern service car. 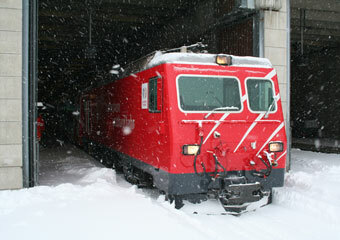 f = To/from Davos, you change trains at Filisur, using the hourly branch line train between Filisur & Davos. The Glacier Express is a real, scheduled train, even if it's aimed at tourists. Ordinary Swiss rail tickets can be used on it, including railpasses (if you have a railpass see here). However, a supplement must be paid in addition to the normal fare which includes the seat reservation fee. You can also choose to add a supplement for lunch, and this is highly recommended as the food is very good. They also have an extensive wine list! 30 CHF (€27) for Plate of the Day. 43 CHF (€38) for 3-course lunch. Children under 6 go free, children aged 6 to 16 pay half fare but must pay the adult supplement. For the cost of travel in the new Excellence class, see above. 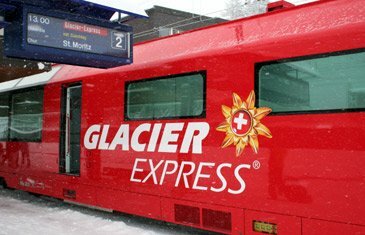 You can buy tickets online at the official Glacier Express website, www.glacierexpress.ch and collect the tickets at the station. The Glacier Express is amongst the handful of Swiss trains that are reservation compulsory. 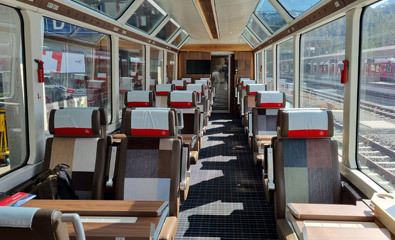 They can get full at peak times, for example high summer when tour groups book blocks of seats, so if you're sure of your travel date I'd recommend pre-booking at www.glacierexpress.ch rather than waiting till you get to Switzerland. Once in Switzerland, you can of course buy tickets and make reservations at any Swiss railway station. By phone with International Rail, 0844 248 248 3, 09:00-17:00 Monday-Friday. They can arrange reservations, tickets & Swiss passes. By phone with the Swiss Travel Service, www.stc.co.uk, on 020 7420 4934. They can arrange all your Swiss tickets or railpasses, plus the Glacier Express seat reservation and supplement and even a lunch reservation on the train. 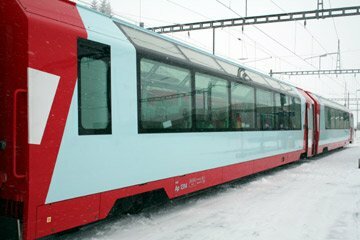 In the USA & Canada you can buy Glacier Express tickets at www.raileurope.com. The fare shown includes the Glacier Express reservation fee. In Australia you can buy Glacier Express tickets at www.raileurope.com.au. 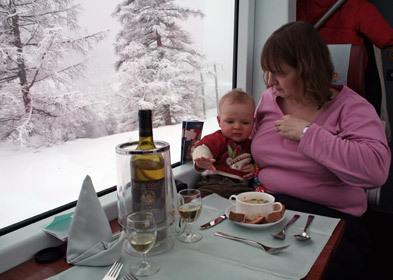 The fare shown includes the Glacier Express reservation fee. In Asia, Africa & South America you can book at www.raileurope-world.com. For a custom-made tour of Switzerland including the Glacier Express with trains, transfer & hotels all sorted for you as a package, call Railbookers. Tell them what you want, and they'll advise you on the best trains, routes & hotels and sort it all out for you on any dates you want. They get great reviews and take good care of their guests. 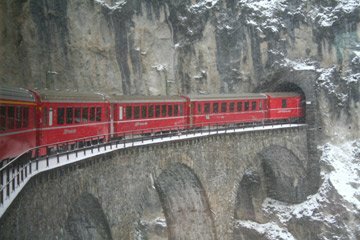 In particular, check out two of their top sellers: Their 8-day Switzerland's Lakes & Mountains tour (link to their UK site) or Swiss Lakes & Mountains tour (link to their US & Canada site) which includes both Glacier Express & Bernina Express trains, and their shorter 5-day Classic Bernina Express & Glacier Express tour (link to their UK site) or Classic Bernina Express & Glacier Express tour (link to their US & Canada site) which also combine these two classic Alpine routes. Escorted tours: If you'd prefer to go to Switzerland to travel on the famous Glacier Express on an escorted tour with a convivial group of travellers rather than travelling solo, here are the two UK companies which arrange escorted tours by train from the UK to destinations all over Europe on various dates through the year, including popular trips taking in the Glacier Express and equally famous Bernina Express. Both companies are part of the same group. These passes now cover both the Rhätische Bahn (RhB) and the Matterhorn Gotthard Bahn (MGB) so therefore cover the whole Glacier Express route between Zermatt and St Moritz. Until December 2016, Eurail & InterRail only gave free travel on the RhB part of the trip, but gave a discount on the MGB. I'm pleased to say that as from January 2017 they give free travel on both RhB and MGB and therefore cover the whole Glacier Express route. All you need is the Glacier Express seat reservation, see the reservation prices above, see below for how to make a reservation-only booking online. Of course, if you like you can use regular local trains over the same route with no reservation is necessary. It's only the GEx itself which needs a reservation. Incidentally, Swiss Passes can save quite a lot of money over full-price Swiss train fares, so read up about Swiss Passes here. You can even travel in the new Excellence class if you have a 1st class pass and pay the Excellence class reservation fee. Go to the official Glacier Express website www.glacierexpress.ch. Click Offers and then the Booking button, and go ahead as if you were buying a ticket. But at Order Process Step 3, change the Abo drop-down box from Season ticket type to Others. This tells it you already have a ticket. At the next stage you should see the ticket cost disappear leaving just the reservation fee. Book this, and you are safely booked on your chosen departure on your chosen date. 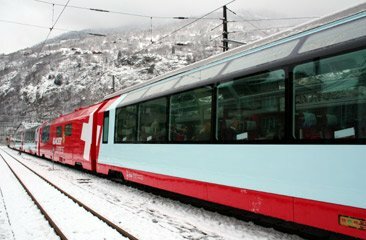 The Glacier Express has its own official website, www.glacierexpress.ch, where you can check up to date times & fares. 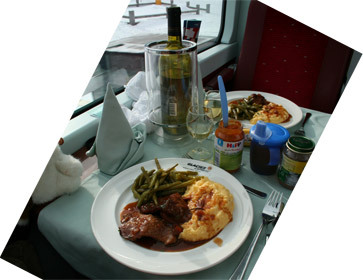 On-board catering is provided by Gourmino, and you can find sample menus and the wine list as www.rgswissalps.ch. 2. Mattertal Valley... The Glacier Express winds its way along the Mattervispa River, descending the scenic Mattertal valley from Zermatt, which is 1,804 metres above sea level, to Visp at just 650 metres and Brig which is not much higher. The steepest sections of this line have a toothed rack placed between the rails which is engaged by a cogwheel under the locomotive so as to maintain its grip. 3. More scenery along the Mattertal Valley. At the end of the valley the train calls at Visp, for interchange with mainline trains to and from Geneva, Bern, Basel & Zurich. 4. Brig. Brig is at the end of the Simplon Pass, and there is interchange here with the mainline trains to/from Milan & Italy. 8. Furka Tunnel... Until the opening of the Furka base tunnel in the early 1980s, trains had to climb over the top of the pass, and it was impossible to keep this section of line open all winter. So the Glacier Express only became a year round service in 1982. A preserved railway now runs steam trains in summer over the old line by-passed by the tunnel. Car-carrying trains shuttle road vehicles through the Furka tunnel, you'll see the car loading terminals as you pass through. 10. Lunch is served... On the newest summer Glacier Expresses and on the only winter one, lunch is served at your seat by friendly stewardesses. The food is good, and the wine list quite extensive - the Johannisberg Swiss white wine is excellent, for around 41 CHF for a bottle. Given the scenery, it could just be the best restaurant in Switzerland..! But if you're on a tight budget you're equally free to bring your own food, drink and even bottle of wine. 11. The Glacier Express descends to Disentis. Here, it is handed over from the Matterhorn Gotthard Bahn (MGB) to the Rhätische Bahn (RhB) and an RhB locomotive takes over. 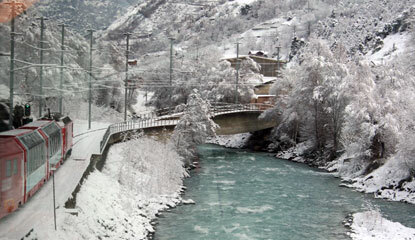 The Glacier Express is electric-powered throughout its journey. You've time for a wander on the platform. 12. The Rhine Gorge. After leaving Disentis, the train joins the wonderful Rhine Gorge. A sort of miniature Grand Canyon Swiss-style, the train snakes along the rock-strewn river between the steep valley sides which are dotted here and there with caves. 13. 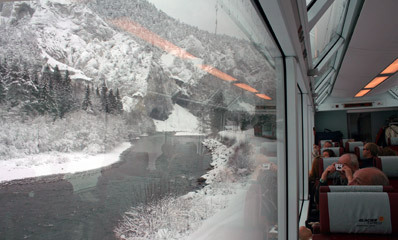 Another picture of the Glacier Express snaking along the Rhine Gorge. When it arrives at Chur it's just 585 metres above sea level. Hilltop castle. The Chur-St Moritz line is part of both the Glacier Express & Bernina Express routes. 15. The Landwasser Viaduct. The train follows the Albula Valley all the way to St Moritz. 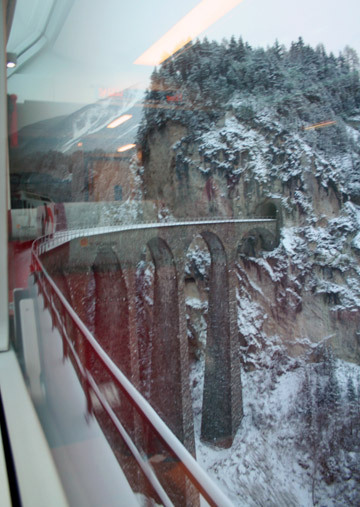 Just before reaching Filisur, it crosses the famous Landwasser Viaduct where most publicity shots of the Glacier Express are taken. The railway runs along a cliff-edge on one mountain, then leaps across the viaduct straight into a tunnel through another mountain. 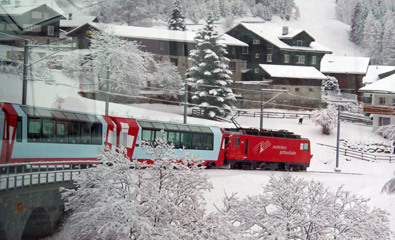 The left-hand photo shows regular Rhätische Bahn coaches which are attached to the Glacier Express between Chur & St Moritz. The Glacier Express thus forms part of the regular hourly train service over this section of line. In the right-hand photo, a St Moritz-Chur train has container wagons attached to the back, transporting food to local supermarkets! 16. St Moritz. After a steady climb, the Glacier Express finally reaches St Moritz, 1,775 metres above sea level. 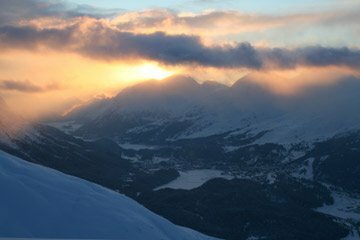 If you don't find accommodation that suits you in St Moritz, try nearby Samedan or Pontresina, or for a real top-of-the-mountain experience, take a local train a couple of stops from St Moritz or Samedan to Punt Muragl, then the funicular railway up the Muottas Muragl mountain to the wonderful Romantik Hotel Muottas Muragl. The view over Samedan, St Moritz & the Engadin Valley from restaurant of the Romantik Hotel Muottas Muragl. What time of year is best? The Glacier Express runs all year round apart from a short break from Late October to mid-December (see the timetable above), so you can go almost any time. Indeed, you really need to do it twice, as it's a totally different experience through a snowy wonderland in the depths of winter compared to a summer jaunt through lush green Swiss meadows. You can still go in the October-December period when there's no Glacier Express, as you can use local trains along exactly the same route, just with a change of train or two somewhere, use www.sbb.ch to find times. Is eastbound or westbound better? Either is fine as both directions do the whole run in daylight, even in winter. Should you go first or second class? The scenery is exactly the same, the only difference is the seating, see the photos above. As you can see, 2nd class seats are arranged 2+2 across the car width, 1st class seats are arranged 2+1, so 1st class seats offer more elbow room and fewer passengers per car. It also means that there are tables-for-two on one side of the aisle, which are nicer for couples than sharing a 4-seater section in 2nd class. But there's no difference in on-board service, all you're paying for is the lower-density seating. 2nd class is absolutely fine. Which side of the train to sit? Eastbound, the right-hand side is best along the Mattertal Valley between Zermatt and Brig, and also between Chur and St Moritz with great views of the the Landwasser Viaduct. In the Rhine Gorge, all the river scenery is on the left. Westbound, it'll obviously be the opposite side. However, when booking you can't tell which way round the carriages will be, so unfortunately you can't reserve a seat on a specific side. But feel free to move if seats are free, and if there's four of you, you could reserve the two window seats on both sides. Luggage arrangements: Like any other European train, you take your luggage on board with you and within reason you can take whatever you like, suitcases, backpacks, whatever. You put your bags between the seat backs, or in a small luggage area at the end of the car. Food on board: There's a catering car selling tea, coffee, snacks and souvenirs and they offer a lunch service at your seat. Or you're free to bring your own picnic and even wine on board, as on other European trains. After the first world war, Switzerland steadily gained popularity as a winter and summer holiday destination for those who could afford it. Railways grew up to support this tourism, and through services between Brig, Chur and St Moritz started in 1926. But it was in June 1930 that the first Zermatt to St Moritz 'Glacier Express' started running, initially summer only, and run jointly by the BVZ (Brig-Visp-Zermattbahn), FOB (Furka Oberalp Bahn) and RhB (Rhätische Bahn). It could not run all year because of the impossibility of keeping the line over the Oberalp pass open in winter. Construction of the Furka base tunnel started in 1973, and at long last in 1982 all-year operation was inaugurated between Zermatt and St Moritz. 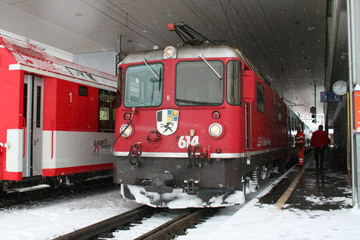 BVZ and FOB merged in 2003 to form the MGB (Matterhorn Gotthard Bahn). 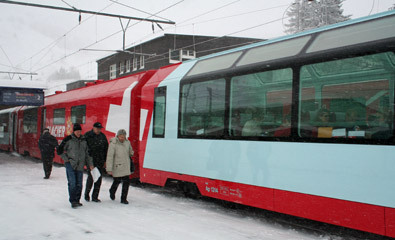 The Glacier Express has been progressively developed as a premier tourist attraction in its own right, and rightly so, though it continues to form an integral part of the Swiss transport network. There's no shortage of hotels in Zermatt or St Moritz (I recommend searching for hotels using www.hotelscombined.com), but one place deserves a special mention as it's both cheap (at least by Swiss standards) so will save you money, and somewhere really special. The Romantik Hotel Muottas Muragl is near St Moritz, reached by local train to Punt Muragl then funicular railway up the mountain to the hotel, perched at 2,456 metres overlooking the Engadin Valley. To reach the hotel from St Moritz, take the hourly local train 2 stops to Punt Muragl Staz (6 minutes), walk 200 yards to the funicular station and take the funicular railway to Muottas Muragl station (10 minutes).